Even with the best design considerations and best manufacturing practices, ‘squeeze-out’ can bleed into unwanted areas. Prepreg resins and coverlay adhesives are common sources of squeeze out that flow during lamination onto conductors, pads, cavities, fingers, or other features. Low flow adhesives like FR406NF, Taconic FastRise27 series, Rogers RO2929 bondply can still flow into unwanted areas requiring removal to meet specification. 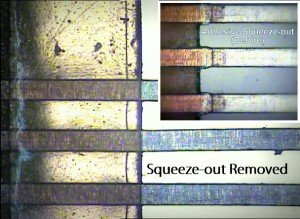 Micron Laser Technology provides squeeze-out removal services for both rigid and flex circuits. Resins and adhesives can easily be removed from cavities and metal etched features. Generally, the squeeze-out flow is limited to the perimeter of the feature it encroaches and allows for reduced ‘race-track’ laser processing and cost. In this case, only a limited border width area has the squeeze out removed that significantly reduces the total process square area. 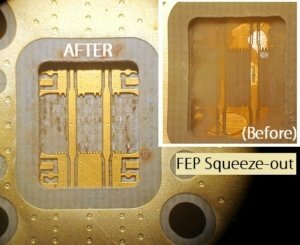 Micron Laser Technology’s laser squeeze out removal processes can produce minimal carbon redeposits and prepare the surface for immediate plating, tin, or solder. In some cases, surface prep processes (post laser) like plasma may promote plating adhesion. Squeeze-out removal can take on any shape or pattern and hold a tolerance of 25um. In areas where adhesive or resin flows onto both metal and dielectric, MLT has a control depth removal process that can remove adhesive from the metal surface and stop in an exposed dielectric. Similar lasers processes are available for plating bleed as well. An example plating defect may include gold plating bleed between SMT contacts. 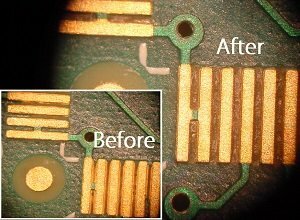 Before discarding your PCB’s, call MLT Sales to see how laser squeeze-out services will recover your bare and populated circuit boards.